Provide consistent buffer descriptor to deal with arbitrary buffer layout. These are independently used by clients. For example, a client can use only the limit stencil evaluation, or a client can refine subdivision surfaces and draw them with the PatchTable and Osd tessellation shaders. All device specific evaluation kernels are implemented in the Evaluator classes. Since Evaluators don't own vertex buffers, clients should provide their own buffers as a source and destination. There are some interop classes defined in Osd for convenience. OpenSubdiv utilizes a series of regression tests to compare and enforce identical results across different computational devices. Osd supports both uniform subdivision and adaptive subdivision. Once clients create a Far::StencilTable for the topology, they can convert it into device-specific stencil tables if necessary. The following table shows which evaluator classes and stencil table interfaces can be used together. 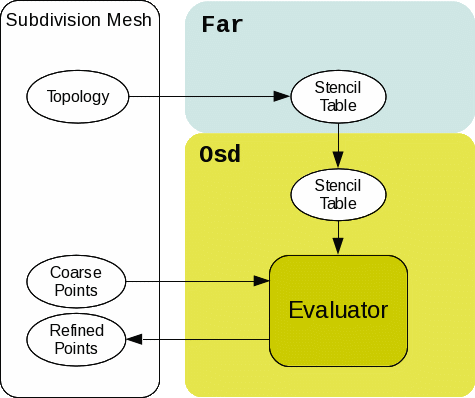 Note that while Osd provides these stencil table classes which can be easily constructed from Far::StencilTable, clients aren't required to use these table classes. Clients may have their own entities as a stencil tables as long as Evaluator::EvalStencils() can access the necessary interfaces. Limit stencil evaluation is quite similar to refinement in Osd. 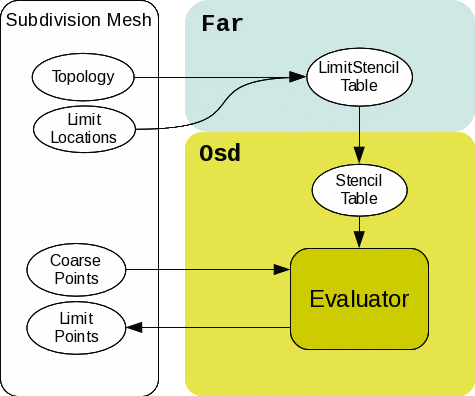 At first clients create Far::LimitStencilTable for the locations to evaluate the limit surfaces, then convert it into an evaluator compatible stencil table and call Evaluator::EvalStencils(). Another way to evaluate the limit surfaces is to use the PatchTable. Once all control vertices and local points are resolved by the stencil evaluation, Osd can evaluate the limit surfaces through the PatchTable. GPU limit evaluation backends (Evaluator::EvalPatches()) only support BSpline patches. Clients need to specify BSpline approximation for endcap when creating a patch table. See end capping. One of the most interesting use cases of the Osd layer is realtime drawing of subdivision surfaces using hardware tessellation. This is somewhat similar to limit evaluation with PatchTable described above. 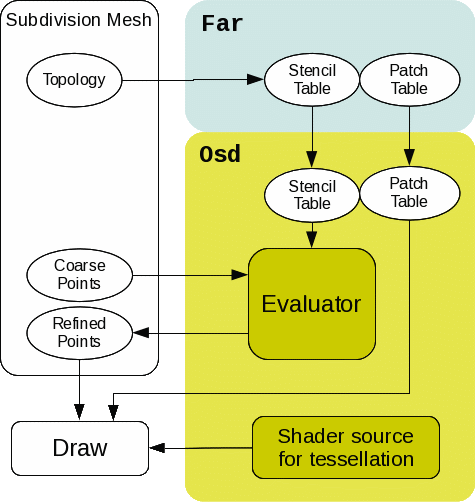 Drawing differs from limit evaluation in that Osd provides shader snippets for patch evaluation and clients will inject them into their own shader source. See shader interface for a more detailed discussion of the shader interface. 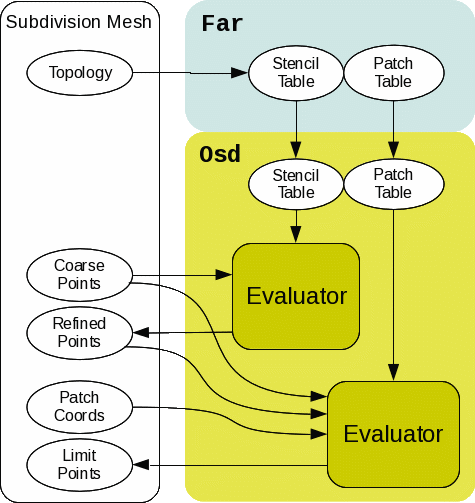 All Osd layer APIs assume that each primitive variables to be computed (points, colors, uvs ...) are contiguous arrays of 32bit floating point values. The Osd API refers to such an array as a "buffer". A buffer can exist on CPU memory or GPU memory. Osd Evaluators typically take one source buffer and one destination buffer, or three destination buffers if derivatives are being computed. Osd Evaluators also take BufferDescriptors, that are used to specify the layout of the source and destination buffers. A BufferDescriptor is a struct of 3 integers which specify an offset, length and stride. BufferDescriptor can be used for an interleaved buffer too. Although the source and destination buffers don't need to be the same buffer for EvalStencils(), adaptive patch tables are constructed to first index the coarse vertices and the refined vertices immediately afterward. In this case, the BufferDescriptor for the destination should include the offset as the number of coarse vertices to be skipped. Also note that the source descriptor doesn't have to start with offset = 0. This is useful when a client has a big buffer with multiple objects batched together. One of the key goals of OpenSubdiv is to achieve as much cross-platform flexibility as possible and leverage all optimized hardware paths where available. This can be very challenging as there is a very large variety of plaftorms and APIs available, with very distinct capabilities. In Osd, Evaluators don't care about interops between those APIs. All Evaluators have two kinds of APIs for both EvalStencils() and EvalPatches(). Generic signatures which take arbitrary buffer classes. The buffer class is required to have a certain method to return the device-specific buffer representation. The buffers can use these methods as a trigger of interop. Osd provides a default implementation of interop buffer for most of the backend combinations. For example, if the client wants to use CUDA as a computation backend and use OpenGL as the drawing API, Osd::CudaGLVertexBuffer fits the case since it implements BindCudaBuffer() and BindVBO(). Again, clients can implement their own buffer class and pass it to the Evaluators.